When the movie Hidden Figures came out in 2017, I made sure to go see it in theaters. Not only did it sound interesting, I wanted Hollywood to know that a movie about black female scientists had a paying audience. Like most people, I had no idea of the story of the “colored computers,” women whose work helped the U.S. get into space. Dorothy Vaughan, Katherine Goble Johnson, and Mary Jackson spent years doing mathematical calculations that were critical our efforts in World War II, the Korean War, and the space race against the Soviet Union during the Cold War. If you want to dig a little deeper into their story, you can check out the book that the movie was based on. Hidden Figures: The American Dream and the Untold Story of the Black Women Who Helped Win the Space Race by Margot Lee Shetterly came out in 2016 and tells the story of the computers in greater detail. The book follows several generations of computers, starting with Dorothy Vaughan who joined during the expansion of aeronautics research at NACA (the precursor of NASA) during WWII. With so many men off at war, the need for mathematicians meant that many women, even black women, were hired into the workforce at Langley. And even after the war, the need to maintain the superiority of our air forces during conflicts like the Korean War meant that other women like Mary Jackson and Katherine Johnson came to join Dorothy. Eventually, the importance of the space race meant the creation of NASA and starting space research basically from scratch, bringing in even more talent such as Christine Mann Darden. 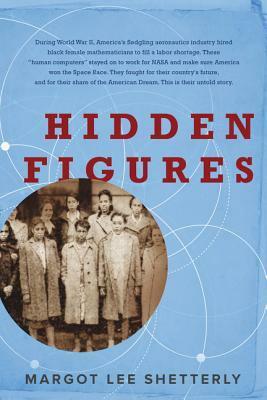 Hidden Figures was Shetterly’s first book, and that shows a bit in the way parts get bogged down in the overwhelming amount of detail. (It took me a while to read this one.) According to the Kindle version, the Notes and Bibliography take up 20% of the book. But at the same time, that detail allows a full picture of what life was like during these times, particularly for these women and their families. As someone who was born in the 80s, this book provides valuable context for not only the civil rights movement and major historical events, but also scenes of daily life during these times. The movie is an excellent adaptation, streamlining all the detail into a smooth narrative. Of course, that means it is not always perfectly factual; the timeline of these women’s careers is greatly compressed, for example. There is also a Young Readers version of the book that I understand is more readable as it is for children. As a scientist, there were a couple of notes from the book that I found interesting. First, most of these women were originally teachers, one of the most stable, respected professions for smart black women at the time. Yet these were women that could (and in some cases, did) have received advanced degrees in mathematics and engineering. Imagine today if the same people who are NASA scientists were instead high school teachers! Second, the structure of scientific research that Shetterly describes at NASA is very similar to science today. She describes teams led by engineers (who today would be called Principal Investigators or PIs) with support staff such as the computers (today’s laboratory technicians, including myself). The engineers would draft research reports or memos that would be picked apart by a committee before being finalized; this is much like the peer review process today governing how scientists publish papers in journals after being critiqued by external reviewers. As a lab tech, I appreciated that this book focused on how the contributions of the computers to NASA’s research were just as important as those of the engineers. However, the fact remains that many of the computers should have been engineers to begin with, being just as intelligent and capable as their supervisors, and many fought their whole careers to advance and be accepted as such. It has been wonderful to see these women get the recognition they deserve. Katherine Johnson now has two NASA facilities named after her, and she received the Presidential Medal of Freedom in 2015. Not only are the “hidden figures” an important part of black history and an important part of U.S. history, they also helped to pave the way for women like me in science. Even if I never knew it until recently. Check out my review of the Hidden Figures movie here. I grew up in Florida watching Space Shuttle launches, and let me tell you, it doesn’t get any less cool with age. If you missed it, today was a big day for SpaceX, the commercial space flight company led by Elon Musk. They successfully launched the Falcon Heavy rocket in a test off Cape Canaveral. Watching the live stream was pretty exhilarating; I can only imagine how the engineers that worked on it feel. SpaceX has launched plenty of rockets before; today’s flight used those rockets, the Falcon 9, as boosters for an even bigger main core. The coolest part for me was seeing these two boosters split off and then come back to land at the Cape. The core itself was to land on a floating platform in the Atlantic; unfortunately the feed cut out, so we are still waiting to hear its fate. And what was the payload on this test rocket, you might ask? Elon Musk’s Tesla Roadster. I am not kidding. You can watch “Spaceman” live here as he drifts towards Mars. The Falcon Heavy will probably never carry people, but SpaceX is working on an even bigger rocket, the BFG, that hopefully someday will. This is a story of how my parents trolled me…on my birthday, no less! You may remember that one of my pet peeves is cute holiday imagery of penguins and polar bears living together in harmony, because as a biologist I know that penguins and polar bears do not overlap in the wild. Penguins live in the south pole (only Galápagos penguins live near the equator), and polar bears live in the Arctic. Never the twain shall meet. My mom also makes me a creative birthday cake every year. She’s done Jane Austen books, a Skellig Michael landscape, and even jungle animals. After I analyzed the species of the jungle animals, I think she assumed I’ll always be blogging about her cakes. Yes, she spent hours making these intricate cupcakes, just for the sake of irritating me by putting polar bears and penguins together. She has whole books full of cupcake designs, so I imagine that once she saw these two animals she couldn’t resist. To be fair, they were really cute, and also tasty. Marshmallow for stomach, Starburst for beak. Oreos for wings, and he’s also dipped in chocolate. I’ve seen a lot of calls recently for scientists to do some outreach and explain to the general public what they do for a living, how science works, etc. A major effort came in February after David Steen, PhD (@AlongsideWild), tweeted that “most Americans can’t name a living scientist.” With some help from Mary Roblyer (@darthmom7), the hashtag #actuallivingscientist took off on Twitter, with scientists introducing themselves and their work. So…hi! I want to do something similar here, as well as open the floor up for questions. I have a Bachelor’s in Zoology from a small, four-year liberal arts university, with emphasis on genetics and animal behavior. I received an honors diploma for my independent study research on developmental genetics of C. elegans, a tiny hermaphroditic roundworm. (I also had to sit an exam, but that’s less exciting.) I also did internships at zoos, doing animal care work as well as observational research on various animal behavior. After graduation I worked as a zookeeper and then at an animal shelter for a few years. I currently work at a medical school in the research department. I am a research assistant in a lab that investigates how to grow new blood vessels in hearts with heart disease, using stem cells created in the lab. I have been listed as an author on several papers we have published in research journals. I also make cool designs with my pipette tips when I bored at work. For personal and professional reasons, I can’t give too many details about my current work. But I will do my best to answer all your questions as fully as possibly. The questions don’t even have to be about biology; I have plenty of scientist friends in other disciplines I can appeal to. Though, if you have a very specific question like How much Force power can Yoda output?, I’d encourage you to try submitting it to What If? because I don’t have time to watch The Empire Strikes Back repeatedly to check the X-wing’s rate of ascent. I am unavailable to march today, but one of my sorority sisters is attending the Women’s March in DC and offered to make a sign listing the names of those of us there in spirit, and I asked her to include my own. In the meanwhile, I’m going to give a shout out to a movie featuring some other awesome women: Hidden Figures. This biopic follows three African-American women at NASA during the space race of the 60s. Though some of it is a bit dramatized, it is all based on real life. I saw it opening weekend and loved it…and apparently so did a lot of other people. In its opening weekend it actually beat Rogue One (which had already been out a few weeks, but was playing in nearly twice as many theaters) at the box office, and held on to the #1 spot over MLK Jr. weekend, too. It’s a great movie for anyone to enjoy, but I would really encourage all young women especially to see it. Katherine Goble (Taraji P. Henson) is a brilliant mathematician working as a “computer” at Langley Research Center and is assigned to the Space Task Group to help with the calculations for the launch and landing of Alan Shepard and John Glenn. In Glenn’s case, putting a man into orbit around the Earth has never been done, so there isn’t a mathematical model for the situation. Rather than looking at it as an “applied math” situation from a physics perspective, Goble finds a purely mathematical model that simply fits the numbers. My favorite quote from her: “So, yes, they let women do some things at NASA, Mr. Johnson, and it’s not because we wear skirts. It’s because we wear glasses.” I think I related to her most of all the women. Mary Jackson (Janelle Monáe) is an aspiring engineer, attempting to take night classes at a white high school. She is supported in this by her Polish-Jewish boss, but her husband (Aldis Hodge) is more hesitant. I liked how the movie showed the struggle for civil rights not as one united movement pushing forward to a single goal, but going in fits and starts, with many different foci, sometimes at odds within the movement (white women especially don’t appear as allies here). When Mary doesn’t want their young kids to see the news about a firebombing of a bus, her husband replies, “Everybody needs to see this.” It was a powerful moment for me, thinking about present day events: videos captured on phones and uploaded, violence against innocent people that can no longer be hidden. If we want to change the world, we have to face it first. So the science part is great. But the movie also shows these women as not just scientists, but leaders in their community as well. They are moral women; we see them going to church, raising children, and participating in positive relationships with good men. They support each other in their struggles and ambitions. I was so impressed with the marketing for this movie. It did a great job focusing on the three leading women in advertisements, so much so that I was surprised by the appearance of several white or male actors during the movie because I hadn’t even realized they were going to be in it. I think this shows that a movie featuring black women can perform well, and hopefully Hollywood will taken this lesson from Hidden Figures and give us more.